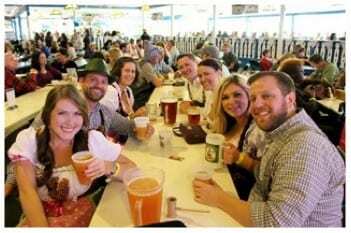 DAHLONEGA, Ga. – It is time once again for White County’s biggest festival – and the world’s biggest beer drinking event — the 48th annual Oktoberfest. Streets in this Alpine city will begin to swell noticeably tomorrow (Sept. 8) when the kickoff parade rolls through town at noon led by grand marshals Uschi and Marcel Blankenburg and Sis and Gene Garrison. The festivities will continue every weekend in September and will become a daily event in October. The sights and sounds of people having fun will fill the air and everyone will begin to stuff themselves with a mouthwatering variety of sausages, roasted meats and big, big pints of beer, while declaring “Prost” a German toast. The annual celebration will run from Sept. 6-9, Sept. 13-16, Sept. 20-23, Sept. 27-30 and Oct. 1-28. Festhalle admission is $8 Mondays through Fridays, $10 on Saturdays and free on Sundays. The times are 6 p.m. to 10:30 p.m. on weekdays, 6 p.m. to midnight on Fridays, and 1 p.m. to midnight on Saturdays.